Twenty-two National Health Corps Florida AmeriCorps members, two former members and several of their friends spread out across three locations in the downtown Jacksonville community to build gardens and renovate properties for the Martin Luther King Jr. (MLK) Day of Service on January 21. The Salvation Army – Towers Center of Hope location needed a residential garden and a renewed waiting space for the public to sit while the nighttime meal ministry starts. The Liberty Center owns several transitional and permanent properties that required gutting and enhancement of their surroundings. 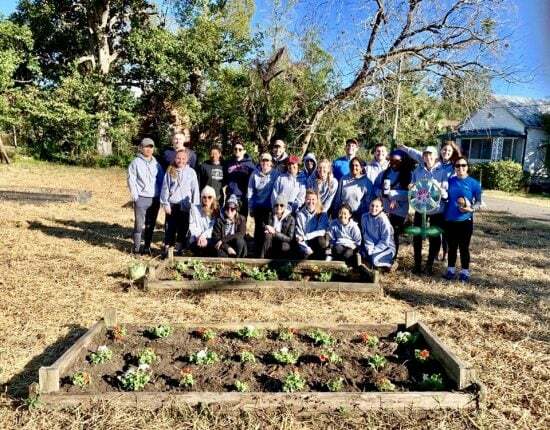 The Eastside Community Coalition requested that the members design a new garden with soil, fresh grass and flowers and build a walkway path with benches for the Eastside community. They are returning to this location soon to add more beautification to this project. Every year National Health Corps Florida participates in MLK Day, hosted by the Corporation for National & Community Service, to tackle local communities facing poor social determinants of health and advance Dr. King’s dream of opportunity for all. A special thank you goes to HabiJax, Lowe’s Home Improvement and Philips Garden Store for contributing tools, flower seeds and other various gardening material essential to the success of the three service projects.